Just as Eleanor must attend a glamorous party in A Darkness Strange and Lovely, I am certain all of you ladies and gentleman will one day be faced with an exciting ball of your own—if you have not already attended one, of course! And just as Eleanor must ensure proper etiquette and preparations for any and all social events, I want to make sure YOU are well-equipped. Below are what I deem the most important tips to get you ready for your next 1876 ball. Tip #1: For unmarried young ladies, it is imperative that you practice your Grecian Bend prior to the event. Though people of more stern sensibilities might laugh over this popular pose, many women are well aware of its enticing powers. With your bottom high and your chest low, do not worry if you feel a bit like a camel—eligible bachelors find the Grecian Bend very appealing. And of course, remember: if you do not practice, you might find yourself tipping over and looking quite the ninny. As such, make sure you practice the Grecian Bend weeks in advance of your next ball. Tip #2: For women of all ages, make sure your gown is appropriate to your age and situation! If you are young and unmarried, light colors and gauzy, floating fabrics are acceptable. 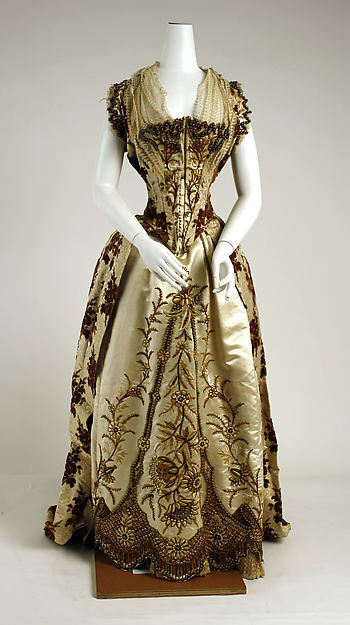 But if you are married or older, though you may be permitted to don lighter shades for the ball, it is best if you select a gown made of silk. And though silk would almost never be suitable for dancing, it will always reflect well upon your older, more stable position. For men, however, there is absolutely no variation allowed. You must wear a black dress coat, black pants, and a black or white vest, no matter your age or station. No deviations allowed, men! Tip #3: Make sure your travel and chaperon arrangements are properly planned well in advance of the ball. One would hate to miss one’s ball because of a forgotten carriage! Or worse, one would hate to miss because one’s chaperon fell ill. If you are an unmarried girl, then make sure your chaperon—an aunt or your mother or even an older family friend—is prepared to go exactly when you are! Tip #4: Once you are at the ball, if you are a young woman, then you must always have your dance card ready. Simply consider how awful it would be to not have your dance card ready the instant a handsome gentleman seeks your hand for a waltz. He might deem you too scatterbrained and move onto the next, better-prepared young lady! Recall: it is up to the gentleman to find you and ask you to dance, so make yourself available—and a coy smile or two is never remiss. Then, once the young man has penciled his name onto your dance card, be sure you are ready and available when it comes time to dance with him. For young men, when you invite a woman to dance, be sure you bow as you offer your invitation–and do not rise until she has offered you a response! Should she refuse, offer her a second bow and depart right away. Should she accept, then write your name—legibly, of course!—onto her dance card. Then, when it comes time to dance, be sure you are ready and available. Tip #5: Once the ball has ended, make sure you do not forget to call on you host or hostess during the next week! It is only good etiquette to visit the generous host/hostess and to thank them. Though, if the host/hostess is out, it is sufficient to simply leave your calling card. Should you forget, then they may not invite you to their next ball. There you have it, young ladies and young gentleman—my top 5 tips to get you ready for your next Victorian event. Oh, and of course—don’t forget the most important tip of all: Have fun!